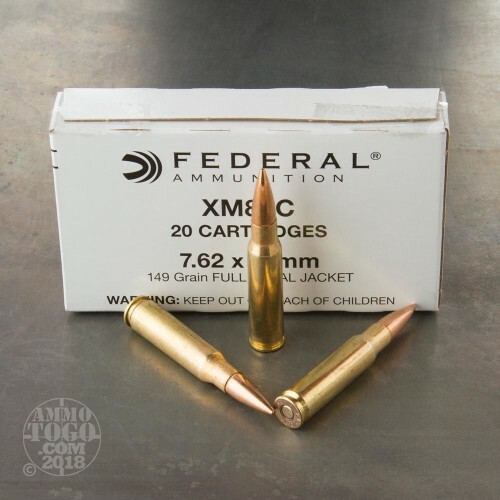 This package contains 500 rounds of Federal Lake City XM80C 7.62x51 NATO (.308 Winchester) ammunition. Each round is loaded with a 149 grain full metal jacket (FMJ) M80 Ball projectile. 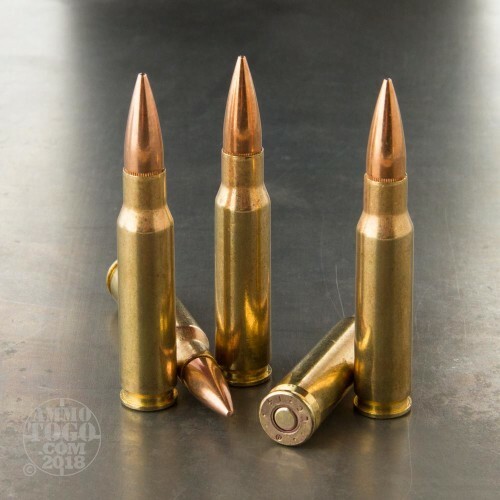 These rounds are identical to the ammunition issued by the United States military. 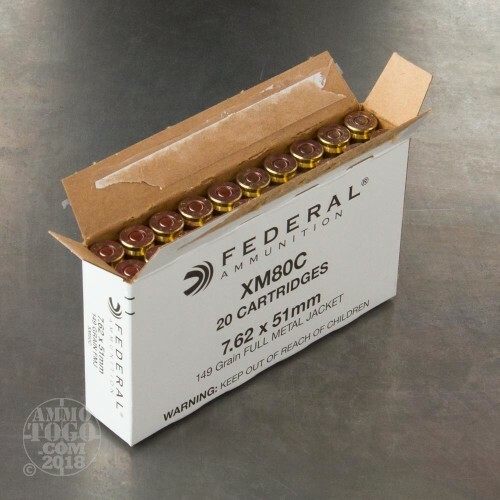 This mil-spec ammo comes packed in 20-round boxes. Guaranteed to provide the precision accuracy and deadly force needed for duty or self-defense, each round produces a muzzle velocity of 2750 feet per second and 2437 foot pounds of muzzle energy. 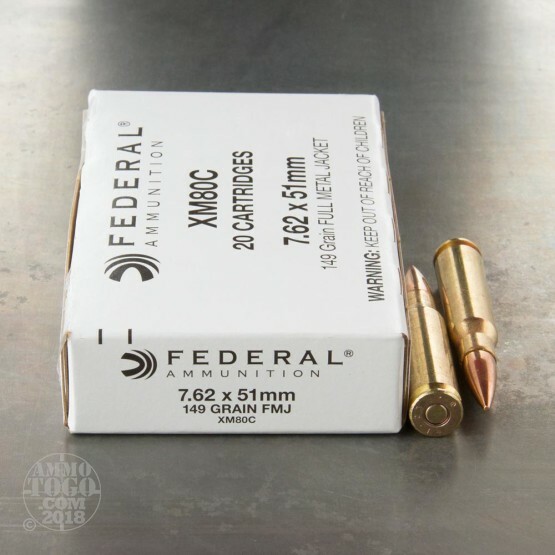 This ammunition is factory fresh from Federal Lake City, featuring non-corrosive boxer primers and reloadable brass casings. Each cartridge has the NATO cross headstamp for easy identification. posted on 4/20/17 by j. Very quick shipment, TOP OF THE LINE customer service. Will be shopping here again, soon. Best price, great ammo, super fast shipping. Will return. Great service. I live in Kentucky and usually get ammo the next day! Can't believe how fast they deliver! Great prices too. Customer for life. Ordered to test the low end target shooting of my M1A and the 100 of 100 rounds worked flawlessly. Normally use 168 grains, but it cost way too much for recreational shooting. Ordered more! Service, delivery, cost and quality can't be beat. Have been buying from Ammo To Go for over a year and every order has been filed with no errors and the product is great. Feeling we'll served, and gosh darn it, fairly stoked at the service. The entire transaction was clear, consise, and timely. Do your research, so as not to be disappointed. You only have yourself to blame. There is with out any place on the internet than can get a5 star comment,whiich is why I am doing so. Service,great,price great,delivery time great? Now for the good stuff. Ammo,just great, no flaws at all,no miss fire, no f t l ,no f t f...just great stuff for shooting,all a round. Thank you Ammotogo,you will be hearing from me again, thanks, Bill.